Ebony and walrus ivory. with brass hinges. This walrus ivory box and games counters, made in Russia (Archangel) in ca. 1830, has slanting sides and panels, while the cover is pierced with festoons of flowers and leaves on a network ground. Russia has a long tradition of ivory carving, going back to at least the twelfth century. 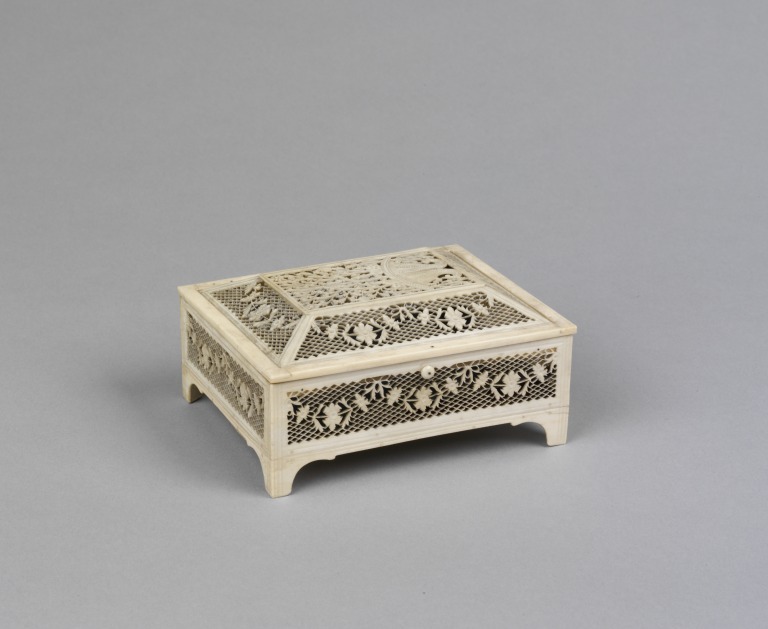 In the seventeenth and eighteenth centuries Moscow and the Russian Court were important centres of artistic patronage, which included commissioning works in ivory. The few Russian ivories in the V&A collection are dominated by those from Cholmogory, near Archangel, in North East Russia. Here a tradition of making decorative objects in walrus ivory, such as caskets and jewellery, grew up in the nineteenth century. The hinged rectangular box is lined in paper and red velvet. The sides of the box and slanting panels of the cover are pierced with festoons of flowers and leaves on a network ground. The flat panel of the cover is also pierced with a basket of flowers, which are symmetrically arranged. 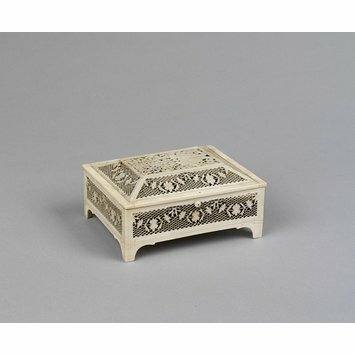 The box has four small integral feet and contains four octagonal baskets filled with red, green, yellow and white pierced ivory pieces. Bequeathed by the late Mrs. Richmond Henry in 1895; acquired by the Museum through Captain E.C. Starkey, Tang Hall, York.